The Landry is a barn conversion located in the heart of Middleton, near Rhossili, it has off street parking and is only a short walk from three stunning local beaches (Mewslade, Fall Bay and Rhossili Bay) and the cottage’s rural setting means that it is a peaceful place to come and unwind. As you walk through the front door you are greeted by a light and open hallway. Through from the hallway you find yourself in the extremely spacious and well equipped kitchen diner, which comprises of a five hob double oven industrial Range cooker, an American style fridge freezer, a dishwasher, a breakfast bar and a table that has room enough to seat 8 people; perfect for family gatherings. The washing machine is located in the adjoining porch just off the kitchen and just beyond the porch is the washing line. The living room has a log burning stove that when lit creates a nice cosy feeling and with two sofas and an armchair there is plenty of room to watch TV with Sky or to watch a movie on the DVD player, you will also find selection of DVDs, board games and books to be used by the whole family. There are four bedrooms overall, two of which are located on the ground floor. The double room has a spacious feel to it, it has a double bed, two bedside cabinets, a chest of drawers and a built in wardrobe. The second bedroom has bunkbeds with a bedside cabinet and a chest of drawers, this room is prefect for kids. The downstairs bathroom has a family sized bath with an electric shower head and a glass panel, there is a wash basin with storage and a toilet, the bathroom is done in natural tones. Upstairs you are greeted by a large landing that offers a mezzanine view of the living room below. The landing is the perfect place to relax as you can sit in a comfortable armchair or in the beautiful rocking chair, it’s the perfect place to read a book. The two other bedrooms are located off of the landing. There is a double bedroom with a double bed, a bedside cabinet and an oak chest of drawers with a mirror. 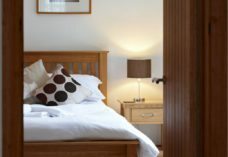 There is also a twin room with two single beds, bedside cabinets with lamps and a chest of drawers. This bedroom also has an en-suite bathroom, with a bath with a hand held shower head, a wash basin with storage and a toilet. All bedlinen and towels are provided. The Landry also offers underfloor heating throughout. This cottage won the building excellence awards in 2009 for home conversions when we renovated the Laundry. Outside there is a spacious south facing patio with a large table and 8 chairs, perfect for relaxing in the summer and having a BBC, the BBQ is provided. Had a wonderful time in this beautiful cottage, it had everything we wanted and more. The perfect place to unwind! Thanks to James and Liz again. We’ll be back!!! walks along the coast. Many thanks, such a fantastic location. countryside. We love it here and hope to be back again soon!